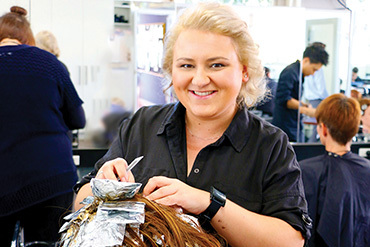 This full-time course leads you to a sensational hairdressing career. Designed to provide you with all the skills and knowledge to become a qualified hairdresser, our focus is to provide students with real life and hands-on hairdressing experience in readiness to enter this exciting industry. You will have access to the latest quality training resources and products. You will learn from our expert teachers; practise in a real-salon environment (with real clients!) and gain all the skills you need to become a successful hairdresser - including very important skills like communication and quality customer service. On graduation you will be skilled in styling, cutting, colouring and selling and ready to take the hairdressing world by storm. Description: This unit describes the performance outcomes, skills and knowledge to consult with clients, analyse existing hair colour and condition and provide a range of hair colour and lightening treatments. This unit applies to hairdressers and barbers with well-developed skills who work in hairdressing salons or barber shops. They use discretion and judgement to manage the client service and take responsibility for the outcomes of their work. Description: This unit describes the performance outcomes, skills and knowledge required to consult with clients, analyse existing hair colour and condition and provide full and partial head highlighting treatments using foil techniques. It requires the ability to use single or combined colour, high lift tint or bleach products to create highlights, lightened sections of the head or multiple colours in the hair. This unit applies to hairdressers and barbers with well-developed skills who work in hairdressing salons or barber shops. They use discretion and judgement to manage the client service and take responsibility for the outcomes of their work. Description: This unit describes the performance outcomes, skills and knowledge to consult with clients, analyse unwanted natural or artificial hair colour and tone, and to select and apply colour correction products to neutralise or change existing base colour and tone. This unit applies to hairdressers and barbers with well-developed skills who work in hairdressing salons or barber shops. They use discretion and judgement to manage the client service and take responsibility for the outcomes of their work. Description: This unit describes the performance outcomes, skills and knowledge to consult with clients, analyse existing hair colour and condition and provide on-scalp full head and retouch bleach treatments. It covers bleach treatments to untreated hair and retouch services to maintain already bleached hair. This unit applies to hairdressers and barbers with well-developed skills who work in hairdressing salons or barber shops. They use discretion and judgement to manage the client service and take responsibility for the outcomes of their work. Description: This unit describes the performance outcomes, skills and knowledge required to consult with clients and analyse hair and facial characteristics to design, recommend and complete a range of complementary classic and current hair designs. This unit applies to hairdressers and barbers with well-developed skills who work in hairdressing salons or barber shops. They use discretion and judgement to manage the client service and take responsibility for the outcomes of their work. Description: This unit describes the performance outcomes, skills and knowledge required to consult with clients, analyse hair characteristics and condition and to complete chemical treatments to reduce curl or wave in the hair. Treatments can be for untreated naturally curly or wavy hair or for chemically treated hair. This unit applies to hairdressers and barbers with well-developed skills who work in hairdressing salons or barber shops. They use discretion and judgement to manage the client service and take responsibility for the outcomes of their own work. Description: This unit describes the performance outcomes, skills and knowledge required to consult with clients and analyse hair and facial characteristics to design, recommend and complete a range of complementary up-styles for long hair. This includes braids, twists, classic rolls and chignons. This unit applies to hairdressers with well-developed skills who work in hairdressing salons or as session stylists. They use discretion and judgement to manage the client service and take responsibility for the outcomes of their own work. Description: This unit describes the performance outcomes skills and knowledge required to complete full or partial braiding finishes to hair as quick service designs. This unit applies to salon assistants who work in hairdressing salons under close supervision and with guidance from more experienced or senior hairdressers. They use little judgement and follow the instructions specified by the hairdresser who has completed the client consultation and manages the client service. It can also apply to more senior hairdressers completing braiding services. Description: This unit describes the performance outcomes, skills and knowledge required to consult with clients, analyse hair characteristics and condition and to complete chemical treatments to add curl or body to short or medium length hair. This unit applies to hairdressers and barbers with well-developed skills who work in hairdressing salons or barber shops. They use discretion and judgement to manage the client service and take responsibility for the outcomes of their own work. 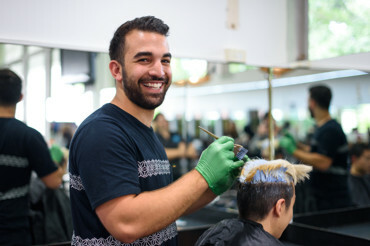 I chose to study hairdressing because I've always dreamt of becoming a hairdresser and CIT had a very good reputation.